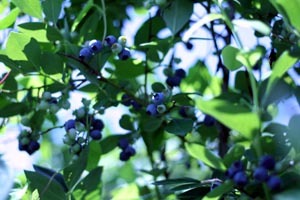 Hannah and I went blueberry picking last Friday. The day was warm and sunny and only slightly humid. It was so great to finally see the sun after a week of thunderstorms that I really wanted to be outside. I also wanted to bake a blueberry pie to bring to a friend’s house that evening. The bushes were loaded with berries and the fields were crowded with families. Hannah and I found an area where no one else was picking and we set to work. I noticed pretty quickly that Hannah picks blueberries like my mother did. I can clearly remember picking berries with my mother. I’d be flitting all over the place, going from bush to bush, and my mom would just stay in one spot and pick until every ripe blueberry on that bush was in her pail. That’s just what Hannah did and that made me so happy – it was almost like having my mom with us. While we picked I eavesdropped listened in on all sorts of conversations. Some were interesting but most were boring and unnecessary. Honestly, I would have preferred if these people had just shut up and picked. I definitely prefer peace and quiet in the outdoors and I don’t understand why so many people feel the need to fill the world around them with sound. All in all it was a pleasant time and in an hour we picked over 7.5 pounds of blueberry. I went home and made the best blueberry pie of my pie baking career. I’m not kidding – this pie was stupendous. And the great thing is that now I’ve got enough blueberries in the freezer for another pie or two. You know, in case I try to outdo myself. YUM! That sounds like so much fun. I love picking blueberries! And lucky Kathy to be treated to your awesome pie! You? Outdo yourself? I can’t imagine such a thing. I’m a one-bush picker too: I used to go after them in the swamp behind our house when I was a kid, and I learned pretty fast that concentrating on one bush was the way to spend the least possible time standing ankle-deep in squishy water. I bet your pie was excellent. Fresh picked berries make the best pies. We were lucky!! It was delicious! Sounds like a wonderful time. No pics of the amazing blueberry pie? I love fresh blueberry muffins. Will you be baking any of those? Mmm, recipe please (for the filling). I made the WORST blueberry pie ever last week, ruining my pie baking self-worth. And wasting a ton of berries. It looks like you two had fun. I know what you mean about peace and quiet. I was at the gym the other day, taking a long hot shower (God knows I can’t take one of those at home w/ a two year old running around) and there was one woman who was droning on and on about how bad her husband is as a parent and as a spouse. Oh well. I know to avoid the shower with her next time. Yum! E and I picked blueberries once. I found out that it takes a lot of blueberries to fill a bucket. I love that you found your mother in your daughter. What a wonderful way to spend your afternoon. How fun! Two things struck me in your post – “only slightly humid” and PIE!!! and I totally agree about people babbling all the time…………. soooo not necessary. What a great, insightful post. Now I’m all inspired to go blueberry picking! Oh yum! I may not have blueberries, but it looks like I’ll have plenty of “seedless” Concord grapes this year. Unfortunately, last year (their first year of fruit) they were loaded with seeds. Hopefully it was just because it was such a hot year, and this year they’ll really be seedless, because I’m really looking forward to some grape pie! I would so love to have been doing that with you. But, and I guess I never really though about it, I never knew that blueberries grew up that high. I always pictured them down around the ground – which I owuld NOT have liked because of my back! Mmmmmm, I do love blueberries! Our picking season is past us and I’ve already cut into the ones in the freezer. They’re just so darn good! You really do hear some interesting conversations! I had the pleasure of hearing several little one’s in desperate need of a nap….screaming! I do enjoy hearing the birds sing and the breeze through the leaves too! Doesn’t Miss Hannah look happy!! 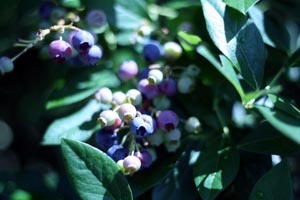 Your knitting blog and my knitting blog both have blueberry picking photos. There are 5 of us — and we picked for friends but we got over 20 lbs. Yes we are now slighly tinted blue with all the berries we are eating. Always a fun part of our summer. I’m so envious of your blackberry haul! When I went a couple of weeks ago the bushes were nearly bare. None in the freezer this winter for me. And, oh yeah, my husband picks berries the same way Hannah does!